You are here: Home / CHEK / CHEK Conference Top Five! 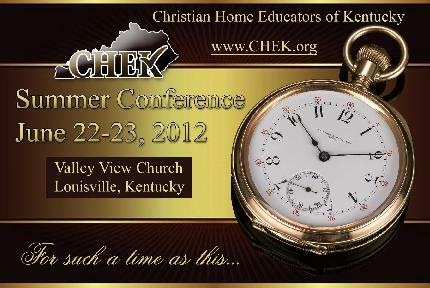 The 2012 CHEK Family and Homeschool Conference begins this week, on Friday. It will be the 4th homeschool conference I have attended this year. And it’s almost guaranteed it will be my favorite. I love going to the CHEK Conference each year. There is just something special about attending my own hometown, homestate conference. I love that it is small enough that I’m sure to bump into lots of friends I don’t get to see very often. I love that the vendors are more available to chat about their products. I love that there aren’t 100 workshops every hour from which to choose. I love that I don’t have to spend a lot of money on hotel rooms or food while there. My purpose for writing this blog post is to inform YOU of why YOU should want to attend the CHEK Conference. Because I think you should want to as well. Especially if you live in or near Louisville. So here they are, the . . .
We should support CHEK because they support us! One of the huge ways they support us is by allowing CHEK members to attend the conference for free. Yes, FREE! Who doesn’t need to be encouraged in homeschooling? Homeschooling is a sacrifice. It’s hard work. What could be better than be surrounded by 100s of other understanding, like-minded homeschoolers? Make new friends or spend time with old ones. You’ll have a great time of fellowship and encouragement! The CHEK Conference is truly a family event. So be sure to bring your teenagers — there will be sessions just for them! And don’t leave the younger kids with a sitter. There are several fun activities for them as well! The Vendor Hall is packed this year, with many of your favorite companies, and perhaps even a few you didn’t know you needed! With more than 60 vendors, there are lots of new things to discover! I hope to see you there! To join CHEK and pre-register for the Conference, visit the CHEK website.